FamilySearch has added more than 2.9 million indexed records and images to collections from Brazil, Canada, Chile, Czech Republic, New Zealand, Peru, Spain, and the United States. Notable collection updates include the 609,536 indexed images from the new Canada, Quebec, Notarial Records, 1800–1920, collection; the 240,983 images from the New Zealand, Archives New Zealand, Probate Records, 1848–1991, collection; and the 464,001 indexed records from U.S., New York, New York Passenger and Crew Lists, 1909, 1925–1957, collection. See the table below for the full list of updates. Search these diverse collections and more than 3.5 billion other records for free at FamilySearch.org. Searchable historic records are made available on FamilySearch.org through the help of thousands of volunteers from around the world. These volunteers transcribe (index) information from digital copies of handwritten records to make them easily searchable online. More volunteers are needed (particularly those who can read foreign languages) to keep pace with the large number of digital images being published online at FamilySearch.org. Learn more about volunteering to help provide free access to the worldís historic genealogical records online at FamilySearch.org. Another whole new area to go exploring. One of the top three webinars. Wonderful information. Very interesting about a topic that often is overlooked - but can yield some great info. I am amazed each time I watch a Webinar. You just open new doors for me to search. These are things I never dreamed of. Watch Linda's other webinars here. If you could not make it to the live event or just want to watch it again, the 1 hour 27 minute recording of "Using Tax Lists to Solve Genealogical Problems" is now available to view in our webinar archives for free for a limited time. It is also available to our monthly or annual Webinar Members for the duration of your membership. Visit www.FamilyTreeWebinars.com to watch. The 3 pages of supplemental syllabus materials are also available for annual/monthly webinar subscribers to download/print/save. Login or subscribe. The special discount coupon of taxes that was announced during the webinar is valid for 10% off anything at both www.LegacyFamilyTreeStore.com and www.FamilyTreeWebinars.com through Monday, June 2, 2014. German Internet Research: A Launching Place for Your Research by James M. Beidler. June 11. "Is it possible to add a child without indicating gender? I know this couple had a child but that is all I know right now. I would like to add the child to the database but it looks like I must choose male or female." Yes! It is easiest to add the child with the unknown gender from the Family View's list of children. Click where it says "Click to Add a Child" and select the "Add a New Child (unknown gender)" option. Click on the image below for a larger picture. In the Child's Information screen, as shown below, the unknown gender will be indicated by the question mark. Hope that answers your question Nancy! The LegacyUserGroup mailing list is a great place to ask a Legacy question. Before subscribing, you can also browse the archives to see if your question has already been asked and answered. Benjamin Franklin is said to have stated, “The only things certain in life are death and taxes.” Taxation can take (and has taken) many forms. The mission of this presentation is to discuss some of they ways in which our ancestors were taxed, the records that were created, and where we might find those records. Additionally you’ll learn how those tax records may help you solve some of your genealogical questions. Join us for the live webinar Wednesday, May 28, 2014 at 2pm Eastern U.S. Register today to reserve your virtual seat. Registration is free but space is limited to the first 1,000 people to join that day. Before joining, please visit www.java.com to ensure you have the latest version of Java which our webinar software requires. When you join, if you receive a message that the webinar is full, you know we've reached the 1,000 limit, so we invite you to view the recording which should be published to the webinar archives within an hour or two of the event's conclusion. In preparation for the webinar, download Linda's 3 pages of supplemental syllabus materials here. The syllabus is available for annual or monthly webinar subscribers. Log in here or subscribe here. Watch Linda's previous webinars here. While at sea attend classes taught by some of genealogy's finest educators, Legacy Family Tree webinar speakers, and Legacy developers. In addition to the classes, you will benefit from the small-group sessions and lots of time to learn from each other. Royal Caribbean International innovation and imagination rule supreme on the groundbreaking Oasis of the Sea. A new adventure waits around every corner on this Deluxe world-class cruise ship. Featuring seven incredible neighborhoods, packed with first-at-sea experiences. Also enjoy the Oceanside Aqua Theater, Starbucks, Broadway hit musical Hairspray, 3D movie theater, a daring zip line that passes over the fun below, a real carrousel, Johnny Rockets old fashioned hamburgers, handmade milk shakes and bottomless fries, giant rock climbing walls, Surf Rider, putt putt golf, designer shopping at COACH and GUESS stores, and much, much more. This is truly the most awe-inspiring and award-winning cruise ship in the world. Airfare, port charges, gratuities, government fees/taxes, and optional tours are extra. To reserve a cabin, or ask questions, contact our travel coordinator, Christy, at 1-800-557-8601 or send an email to LegacyFamilyTreeCruise@gmail.com. For class descriptions, frequently asked questions, descriptions of the places we'll visit, or pictures of our past cruises, visit http://www.legacyfamilytree.com/CruiseInfo_2015.asp. Great webinar for going the next step in understanding what can be done with that DNA data!! Another great Ugo webinar!! Finally know what to do with my dna results! I'm a newcomer to DNA & genealogy. This presentation was just what I needed to get started. 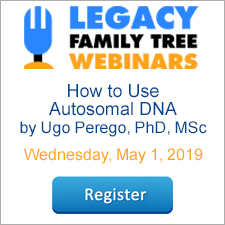 If you are new to DNA, watch Ugo's other webinar recordings in the archives here. If you could not make it to the live event or just want to watch it again, the 1 hour 36 minute recording of "I Had My DNA Tested - Now What?" is now available to view in our webinar archives for free for a limited time. It is also available to our monthly or annual Webinar Members for the duration of your membership. Visit www.FamilyTreeWebinars.com to watch. 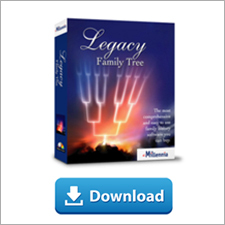 The special discount coupon of dna14 that was announced during the webinar is valid for 10% off anything at both www.LegacyFamilyTreeStore.com and www.FamilyTreeWebinars.com through Monday, May 26, 2014. This July my mother's grandparents' family will hold their first family reunion in twenty years. I've been asked to come up with a wall chart so everyone can see how they fit in. Using Legacy Family Tree's charting software, this should be pretty simple, but I've got some ideas on how to make it really pop. I've included the step-by-step instructions below. First, in Legacy, from the My Toolbar tab, click on Legacy Charting. Next, select the Standard Descendant chart. Zoomed so I can see the entire chart on the screen, it looks like this (click to enlarge...). I like the default colors in the Descendancy Chart. Notice how each child's descendancy of the main couple has their own color. This makes it easier to separate the families. My favorite "theme" is the mug shot theme. Select it by clicking on Appearance > Themes > Mug Shot. Pretty small here, but it makes it easy to see who I'm missing pictures of. Notice the larger pictures? Also the names and lifespan are shown beneath the pictures. In Legacy, navigate to the desired person and click on their Media Gallery button. Click on Add Media > Picture, browse to the location where you saved their picture, click on it, and click Open. Type a caption if desired, and click the Close button. The picture will now appear on the chart the next time you launch Charting. Do everything as described above to add the picture. With the newly-added picture selected in the Media Gallery, click on Options > Set as Preferred. The new picture will now how an asterisk next to its assigned number. Launch Charting to see the changes. My daughter is growing up way too fast. Today was her pre-school graduation day. In addition to contacting my cousins and "pleading" for pictures, I need to take updated pictures of the rest of my children. Too bad my digital camera was stolen recently...I had to get a new one this week (how sad was I, really, about my camera being stolen? it forced me to replace it...). Now I get to learn how to use my Nikon D5300. I've never had a DSLR digital camera before but it is beginning to take amazing pictures. When I am ready to print the chart for the reunion, I have these four choices. 1) Print - print to my printer and tape the forty 8.5x11" pages together. 2) Export to File - take the PDF or JPG into my local printing store. 3) Email - just send everyone the finished electronic copy. 4) Order Chart - this is the one I will choose. Legacy's chart printing service will send me the chart on a continuous roll of paper. At 14 feet wide and 2 feet tall, $28 isn't bad at all. View the May 13 release notes here. One of my favorite technology gurus, Kim Komando (nick-named "America's Digital Goddess") plugged our Legacy Family Tree software this week! So exciting! Click here to read her review. And thanks to another of my favorite technology gurus, Thomas MacEntee, for pointing me to her article. Kim Komando’s passion for all things digital – and decades of experience in the tech and computer industry – has made her the go-to guide for living in the digital world. Her weekly radio show and daily “Digital Minute” are heard on nearly 500 stations; millions more get tech guidance and advice at Komando.com, read her weekly column on USAToday.com, and receive her email newsletters. A wonderful array of tips and tricks applicable to nearly everything a family historian might need when working with digital images. Excellent lecture. The more I hear i'm convinced, I'll have to trade my simple little cell phone in for an Iphone, Ipad, etc. Ha! Ha! I had no idea of the many photo apps available. It's nice to have Maureen review the top ones and describe some features she liked. If you could not make it to the live event or just want to watch it again, the 1 hour 26 minute recording of "Photo Apps for Android, iPhones or iPads" is now available to view in our webinar archives for free for a limited time. It is also available to our monthly or annual Webinar Members for the duration of your membership. Visit www.FamilyTreeWebinars.com to watch. The special discount coupon of photo1 that was announced during the webinar is valid for 10% off anything at both www.LegacyFamilyTreeStore.com and www.FamilyTreeWebinars.com through Monday, May 19, 2014.